Greetings to all in the name of Jesus. Anne and I have just returned from attending the EE Oceania Conference at Camp Tamborine in Queensland, Australia, where the Oceania National Directors, EE Board Chairpersons, National Coordinators, Field Workers and volunteers came together for a week to present and listen to EE ministry reports presented by each Oceania nation. We had daily devotions, worship and prayer, followed by National ministry reports, updates from Executive VP Rod Story regarding the future plans of EE, Anne’s briefing on EE implementation, planning work, reporting structure, scorecard, local area teams and workshops, and discussion on national issues and recommendations for the next EE congress. Overall it was an excellent time of edification for all of us. I would like to thank Anne, the main coordinator of the EE conference, Ilse the administrator, and the entire EE Australia team with Rev Rob and his wife Carol. It was wonderful teamwork and I applaud everyone for their 110% effort in making this conference a great success. I have also been invited to speak at the “Unshaken Youth Conference” organised by Thinking Matters on the 22nd September in Auckland. Please keep me in your prayers. Greetings to everyone in the special Oceania Conference edition! 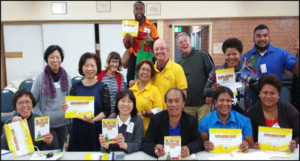 How great it was to join with 23 other Oceania leaders at Camp Tamborine, Queensland, for seven days of jam-packed inspiration, teaching, sharing, networking and praying together. Representatives from Papua New Guinea, Vanuatu, Australia, Tonga, Solomon Islands, Marshall Islands, Cook Islands and New Zealand attended. Rod Story brought us up to speed with “Every One Hears”, the plan for resourcing and growing EE globally over the next four years, as well as New Strategies, Hope for Kids and Congress next year. 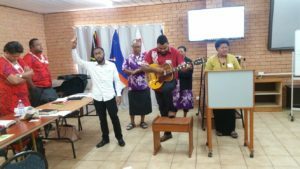 Everyone creatively presented reports from the Oceania nations: No one will forget Pamela Amini’s presentation on “Looking After Your Team Members” and Rusi Tulaga’s on “Fund Raising”? A huge vote of thanks is due to Robert, Coral and David Carner, Pete McCutchen and a team of 15 local helpers from North Tamborine Presbyterian Church, who shuttled delegates from airports and railway stations, helped in the kitchen, provided hospitality, took people shopping and loaned many blankets and duvets to keep us warm. Also we will never forget Kelly McGregor, our chef, who took a week off from work to cook gourmet meals for us and became part of “Team EE Oceania”. 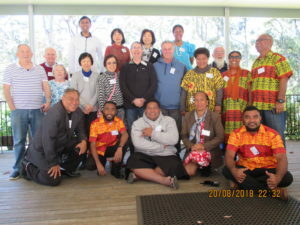 All thanks and praise to God for blessing us and taking us, to a new stage in understanding each other and the potential of being a team of EE leaders in the Pacific.